None of David Cameron's fellow EU leaders is happy with his reform proposals as they stand, an EU source has told the BBC. The PM has been meeting key European Union figures over the deal aimed at keeping Britain in the EU. He faces two weeks of "difficult" negotiations to get all member states to back the deal, the source added. "In a sense, this is a good sign: it means there is some kind of balance in the proposal," they said. "There is a lot of frustration and concerns. It's clear the negotiations are going to be difficult." 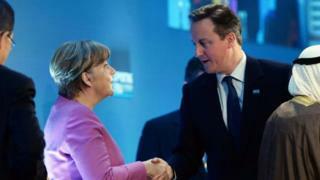 Will Cameron's EU changes work in practice? Among the potential sticking points were Mr Cameron's proposals on changing the EU rules to make it easier for member states to band together to block EU laws - and plans to protect non-eurozone countries. These two demands will need work to be incorporated into future EU treaties. The EU source said some member states had indicated to European Council President Donald Tusk that they found that "unacceptable". Other issues include Mr Cameron's "emergency brake" on in-work benefits and his desire to exempt to the UK from a commitment to "ever closer union". The prime minister is aiming to get a final deal on his reform package, hammered out with Mr Tusk, at a summit on 18-19 February. Such objections are not unusual at this stage of difficult EU negotiations. Mr Cameron is also under pressure at home from some members of his own cabinet, who have been prevented from speaking out in favour of a British EU exit. A cabinet source has told BBC political editor Laura Kuenssberg that the prime minister has promised to stop speaking publicly about the benefits of his EU deal until the renegotiations are complete. "There is agreement that the rules should be the same for both sides, and that no member of the cabinet should speak out until the PM has returned from Brussels with his deal. "Downing St have given a renewed guarantee that everyone will be held to those rules equally," the source said. Culture Secretary John Whittingdale refused to rule out campaigning to leave the EU, in an interview with The House magazine, saying he would look at the agreement the prime minister managed to secure. Mr Cameron held talks on Thursday at Downing Street with European Parliament President Martin Schulz, who said afterwards the negotiations were "not at the end of the process" but that he was "optimistic" of finding a compromise. The PM earlier had met Mr Tusk, Slovak PM Robert Fico, Greek PM Alexis Tsipras, Swedish PM Stefan Lofven and Belgian PM Charles Michel in the margins of the Syria donors' conference in London. Countries on the EU's eastern flank, meanwhile, are to meet next week before providing a joint response to the reform package, Hungary's foreign minister said. Peter Szijjarto told Reuters that if Britain was allowed to restrict EU nationals' benefits it would raise "serious questions" about other large member states replicating the move. Mr Cameron says the proposals will make Britain's position "stronger and better" and that an "emergency brake" on welfare will reduce migration from the EU. But some of his backbenchers say he has missed the point and should be focusing instead on the issue of sovereignty, which they say lies at the heart of the UK's relationship with EU. In a Commons debate, Tory MP John Baron mocked the "red card" which would allow measures from Brussels to be blocked, but only if 55% of EU national parliaments agreed. He told MPs: "The so-called red card system is nothing more than a washed-out lottery ticket. "It would be like a football referee getting out his 'fraction' of a red card, only then having to consult with 14 other officials before deciding what to do - by which time the game is over."